KANSAS CITY, Mo. 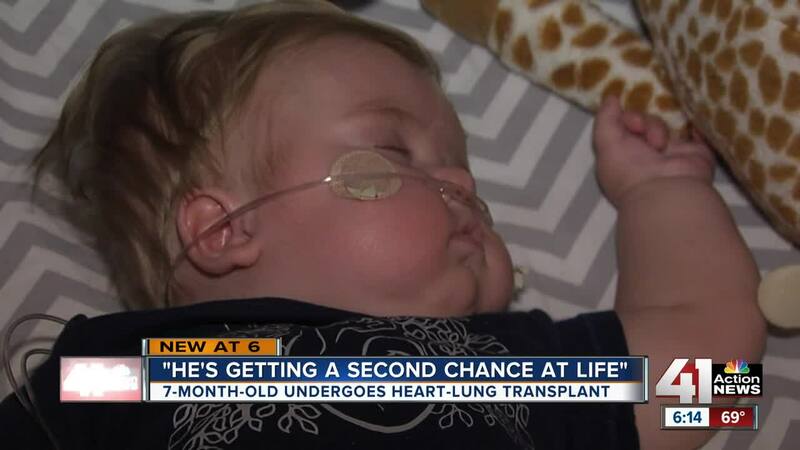 — A 7-month-old boy is back home in the Northland after making history, becoming the youngest person in recorded medical history to receive a heart-lung transplant. "Everything he's been through, he still smiles at the end of the day and he's playful and it makes it all worth it," said Tiffany Palmer, Jack's mother. It's hard to believe that Jack, with his chunky legs and round cheeks, has undergone more than 1,500 procedures in his short life. Those procedures are represented by strands of beads with his name on them, which also represent the fight Jack's shown in his short life. "The odds were stacked against him from the time we found out," said Chuck Palmer, Jack's dad. "And we continued to tell ourselves that we would not do things to Jack, but for Jack as he would allow us to do it." Jack was born with hypoplastic left heart syndrome and an intact septum, which not only affected his heart, but damaged his lungs, too. Tiffany's pregnancy with Jack was high-risk. They went to Texas to see if doctors could perform an inter-utero procedure, but it wasn't possible. Jack's parents were told he likely would not survive the pregnancy. Jack was born via C-section Jan, 16, 2018, and weighed 9 pounds, which is rare for a child with a congenital heart defect. "There were days when we didn't know if he would ever make it, and he fought through that and eventually made the heart-lung transplant list," Chuck said. While the prognosis for babies like Jack isn't great, a surgical team in St. Louis gave it a shot and successfully performed the heart-lung transplant May 3. "He's getting a second chance at life because some other family lost their loved one and made the ultimate sacrifice," Tiffany said with tears in her eyes. Chuck aded, "He's the first infant in 10 years in the country to have a heart-lung transplant and he is the youngest recorded heart-lung transplant (recipient)." Now, Jack and his family take it day-by-day, but he's doing great. Jack is an easy-going baby, according to his parents — happy and eager to kick and laugh. After spending most of his life in the hospital, Jack just now is learning to sit up on his own, but such little moments take on greater significance for his parents. "We're just so thankful we can all be here as family," Tiffany said. There have been highs and deep lows, but they say their family is stronger. The Palmers also have a 2-year-old son and 12-year-old daughter. "Besides thank you, oh god," Tiffany said before pausing to search for the words, "I'm really sorry you had to lose your loved one, but I want you to know that you've given us our son. You've given us a chance to raise him." "And hopefully live a good, quality life," Chuck added. Tiffany continued, "I want you to know that you made the ultimate sacrifice and gave us the best gift ever, and we will never ever take it for granted." The Palmers put Jack down for a nap around noon. He slept peacefully, with a little bit of oxygen to help him breathe, in a onesie that a nurse made for him, depicting a heart and tree branches forming the shape of lungs.